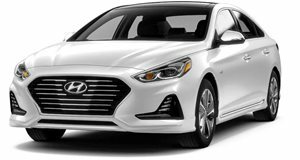 Just two trims are available for the 2018 Hyundai Sonata Hybrid – retaining the same SE and Limited trims as the model has done so for the last few years. The base Sonata SE Hybrid has an MSRP of $25,500 and offers cloth upholstery and 16-inch alloy wheels, but also offers a 7-inch touchscreen infotainment system, automatic light control, AM/FM/MP3 audio system with 6-speakers and a reverse camera, Android Auto and Apple CarPlay functionality, dual-zone climate control, and keyless entry. The Sonata Limited Hybrid is the model worth buying though, despite the $30,500 price tag, as it features leather upholstered seats with heating, ventilation and multi-way power adjustment, LED headlights, 17-inch alloys, a power sunroof, split folding rear seats, and with woodgrain appearance dash inserts. Add the Ultimate Package, which for $3,850 offers you automatic emergency braking, lane keep assist, smart cruise control, automatic high beam assist, rear park sensors, heated steering wheel, an 8-inch touchscreen navigation and infotainment system, Infinity premium audio, and wireless device charging for compatible smartphones.